Medellin has become a popular place for digital nomads. Its recent transformation from being the most dangerous city in the world to the most innovative has made it attractive to lots of people. With spring-like weather year-round, fast wifi, and a low cost of living, it’s no wonder Medellin is becoming so desirable. There are several coworking spaces and even more cafes where you can spend an entire afternoon without having to worry about raised eyebrows from the staff. We just spent six weeks in the “City of Eternal Spring” scoping out the different workspaces to make life easier for you. 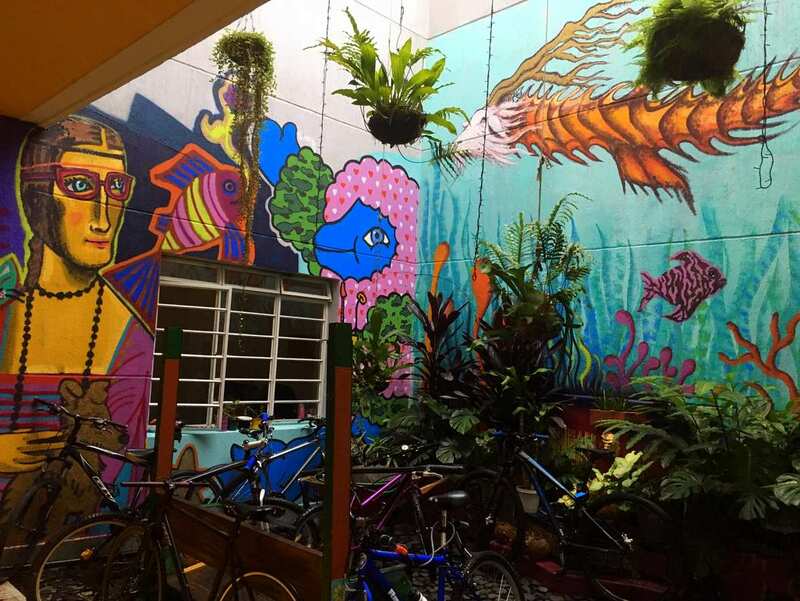 Here are the best cafes and coworking spaces for digital nomads in Medellin. Have you been to Medellin? Where is your favorite place to work? When it comes to digital nomads and tourists in Medellin, the most popular spot is without a doubt the Poblado neighborhood. Some call it “Gringolandia” as such, but don’t let that deter you. This area has an abundance of coworking spaces, cafes, restaurants, and bars, so chances are you’ll end up spending some time here one way or another. This was one of my favorite cafes that I found in El Poblado. They have individual workspaces with a little desk big enough for your computer and coffee. I much prefer this to taking up an entire table as one person. Each workspace also has its own power outlet. There’s plenty of other seating both inside and out. They have a projector that I’m assuming they use to show movies from time to time as well. They have a wide range of coffee, beer, wine, juice, and tea. Unlike a lot of cafes, they also have delicious sounding breakfast and lunch dishes in addition to cakes and bread. The wifi was great as was the friendly staff. Any search for best cafes in Medellin will turn up with Pergamino in the results. They have amazing coffee made any way you like it. There’s plenty of seating both inside and outside. Inside has two rooms – one for the cafe and the other has a bar and projector they were using to show a football match on the day I was there. There are power outlets around the bar but not many. There was one that didn’t even work. If you need an outlet it’s best to get there in the morning as it gets busy in the afternoon. The internet was very fast and stable. You’ll find the password at the top of your receipt so you’ll have to order something before you can use the wifi. Pergamino is all about coffee so they don’t have many food items. It’s better to eat elsewhere before coming here to work. Cozy little cafe in the Manila neighborhood of Medellin. This cute little cafe is in a much quieter area of El Poblado. When I say cute and little, I’m not choosing random adjectives – it’s actually quite small. There are five small tables inside and two tables outside. Each table has its own power outlet. They have many different types of coffee as well as smoothies and pastries. The music was great and easy to work to. Feels like you’re working in a rainforest. More of a restaurant than a cafe, Botanika Lounge is still a great place to get some work done. I would advise going later in the day as they have a full bar. Sip on a michelada or fruity cocktail to boost your productivity (No? Is that just me?). They have a variety of seating options: full-size tables, low tables surrounded by comfy chairs and couches, and small tables meant for people working on laptops. The tropical house music combined with the lush, green plants surrounding the exterior makes you feel like you’re working in the jungle. There are plenty of power outlets as well. Located right in the heart of Poblado, we went here for a VIPKID teacher meetup. It’s very spacious with comfortable seating perfect for long stays. They have a large coffee selection as well as beer and tea. They have breakfast from 7 am – 11 am and light snacks after that. I didn’t notice a lot of power outlets though, so it’s best to charge up before you go. I was really excited to check this place out as it always comes up when you search for cafes in Medellin. Unfortunately, they were closed for renovations when we were there. Hopefully, they’ll be open on your visit and you can let me know how it is. Laureles is another popular neighborhood for digital nomads and expats. It’s much more chilled out than Poblado and has more of a local feel. You’ll still find plenty of places to work and hang out, just minus the crowds. We spent a full month in this neighborhood and really enjoyed it. Fortunately, this location was up and running and we got to check it out. I’m so happy they were because this was my favorite cafe in Laureles. They have standard coffee drinks with a few frappes as well as several different types of tea. I particularly enjoyed the setup and decor. A lot of the furniture looked like what you would see in your grandmother’s living room. They even have an old TV-turned-fish tank. The music was fantastic, playing classic rock such as Velvet Underground, Jefferson Airplane, Jim Morrison, and even the good ole’ Grateful Dead! We were pretty stoked. There aren’t that many power outlets and my back started to hurt sitting in the comfy chair. It’s a great place if you’ve only got about an hour of work. Old-school furniture, fish tank TV, and tasty coffee drinks at Cafe Zeppelin. This is a cafe, coworking space, and hostel all rolled into one. The cafe is on the ground level and they have plenty of coffee options. Unfortunately, it’s not the most comfortable seating – just one long table with benches. There is a small couch, however that’s not a great place to sit to get work done. They also have some outdoor seating, but there were no power outlets outside. You have the option to just buy food or drinks and work downstairs or you can pay by the month and have access to the coworking space upstairs. It has a super chilled out vibe and it’s a great place to socialize. They have a big language exchange on the roof every Friday. My suggestion would be to come later in the day on Friday, grab some pizza for dinner, then head up to the roof when the language exchange starts at 7 pm. This is a great place to work and eat. They have delicious salads – a nice break from typical, heavy Colombian food. They also have really good pizzas. Like Cafe Velvet, they have individual desks for people to work, each with their own outlet and light. There is both indoor and outdoor seating and the decor is great. In addition to pizza and salads, they have amazing looking cakes and cookies. We noticed on their announcement board that they host weekly events and meetups. By the time we noticed, it was too late as we were leaving before the scheduled events. We’ll just have to go back someday (which we totally plan on doing). Cafe Revolucion claims to have the best coffee in Medellin. They certainly have quite the variety of options – french press, Aeropress, cold brew, and more. The seating is a bit limited, so it’s best to get there early. They also follow the Medellin cafe trend of having individual workspaces. There is a power strip tucked between the indoor and outdoor space. It’s nice and airy thanks to the big garage door that’s kept open. Grab one of their paninis or breakfast if you’re there early enough and get to work! Walking into this building, you might mistake it for a high-end hotel. They have a travel desk where you can book hotels, tours, transport, and they even have a car rental desk. Members also have access to accountants, lawyers, and specialists that can help you start a business in Medellin or just help you make sure your visa and taxes are in order. Upstairs you’ll find offices full of teams working away. There’s also a huge coworking space perfect for people staying short term who just need to put their head down and get some work done. Finally, there’s the rooftop with amazing views of the neighborhood. The wifi reaches all the way up there so you can take in the views while being productive. They have monthly meetups and your first day is free, so you can try it out and get a feel for the place. Global Express has a much more professional and traditional office feel as opposed to an artsy vibe. They have multiple other pricing options. Check their pricing page for more details. Located on the 15th and 16th floors of Edificio Milla de Oro, this is Medellin’s newest coworking space. Swanky and professional, it’s a great place for your team or to work on your individual projects. They have meeting rooms you can book easily as well as a personalized audio response system (IVR), which will answer your calls. It also allows you to pass the call to your extension, to your cell phone (anywhere in the world while you have data), or leave a message that will be sent to your e-mail. As you can imagine, this comes at a higher price than other coworking spaces in the city. There are three different options for a flexible (coworking) desk; 25, 50, and 100 hours. However, it’s not astronomical and well worth it. You’re in the most sought-after real estate in the city, after all. Members of the Digital Nomads Medellin Facebook group get a free day, so be sure to join! This is probably the coolest coworking space I’ve ever been to. For one, it’s huge! They have all types of working spaces – hot desk in the common areas, private offices, meeting rooms; anything you could possibly need in a workspace, they have it. In addition to all that, they have a rooftop terrace with a projector where members can hang out and watch movies or football games. The decor is great as well – lots of plants and murals painted on the walls. There’s a kitchen you can use where they also have beer for purchase. Water, coffee, and tea are free. Awesome murals cover the walls at La Casa Redonda. Juana is one of the owners. She’s a super cool chica who can speak three languages. She’s good at remembering names, too. La Casa Redonda is located in the heart of Laureles, close to many delicious restaurants and cafes. I highly recommend this coworking space if you’re staying in Laureles. If you’re looking to make friends – especially with the local Colombian community – this is the place for you. The owner strives to make it more of a gathering place where everyone knows each other rather than an office space. It’s located in a house and has a very homey feel as there are old records, books, and an old recording studio. There are offices and coworking desks in a spacious area perfect for getting work done. You can also enjoy a delicious, homemade lunch! Well, there you have it! I hope this list of the best cafes in Medellin has helped you decide where you should head to get some work done. Whether you prefer a cozy cafe, an artsy coworking space, or a professional office, you’re sure to find what you’re looking for. We thoroughly enjoyed our six weeks in Medellin. It’s very apparent once you arrive why it’s so popular for many people, especially digital nomads. The best part is that the local people are thrilled at all the foreigners flocking to their city and are ready to welcome you with open arms. We fell in love with Medellin, and we’re sure you will, too! Thanks for the detailed list! I’m currently staying in Medellin and will be checking out some of these spots! Sure thing! Thanks for checking it out! We loved Medellin and can’t wait to get back there. You’ll have to check back after you’ve been to some of them and tell me which one is your favorite. Thanks so much Rachel. This is a really helpful review. I am to try out the spaces over in Laureles one day!! I’m glad you found it helpful, Gwendolyn! We really enjoyed Laureles. There aren’t as many cafe options as Poblado but it’s much quieter which makes it easier to get work done (for me anyway). Thanks for reading!